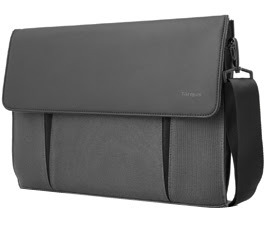 Targus Australia unveiled today its Ultralife line of cases and accessories designed specifically with Ultrabooks in mind. The Ultralife line is composed of a wireless mouse & presenter, USB Hub and Ethernet port, charger and a number of different coloured sleeves and slipcases. First on the list is the Targus Ultralife wireless mouse & presenter (AMW066US) which retails for about 99.95AUD. It is a sleek, slim and multi-functional mouse & presenter with an anodised housing and bronze finish. It converts between a mouse and presenter with one simple twist. It comes equipped with a rechargeable battery, a laser sensor and the latest OFN (Optical finger navigation) cursor control technology. Then there’s the Ultralife USB hub with Ethernet port (59.95AUD). The USB hub features 3 USB ports connecting peripheral devices on the go. The hub also comes with an Ethernet port which is very useful for Ultrabooks that do not have built-in Ethernet port. Targus also adds in to the mix a 65-watt Ultrabook charger. The Ultralife Targus charger comes with 9 feed of cable that offers flexibility in use. It features a built-in surge protection that improves safety from unexpected power surges and spikes. It also features an interchangeable tip system making it compatible across major laptop brands. Then there are the company’s Ultralife Thin canvas sleeves and Thin-Edge slipcases. The Ultralife Thin Canvas Sleeve will cost around 49.95AUD and is designed for the modern person on-the-go. The sleeve can easily be used on its own or slipped inside another bag for hands free carrying. The soft cotton exterior creates a sophisticated finish. There’s a rear drop pocket that provides storage. The sleeve also features smooth, scratch-resistant grips and is line with soft micro-suede. Last but definitely not the least is Targus’ Ultralife Thin-Edge Slipcases which retails for about 69.95AUD. The slipcase is compatible with 13-inch to 14-inch Ultrabooks and features a pleated front design with an expandable front pocket for added storage. It has a magnetic closure that allows for quick access to your device even when the front pocket is full. The exterior is made of soft canvas and has durable, leather-like accents. The interior on the other hand is lined with soft micro-suede.